The couple joined stars Ed Sheeran, Biffy Clyro, Amy Macdonald and Emeli Sande on the red carpet as the awards got under way at the SSE Hydro in Glasgow. Presenter Nicki Minaj told thousands of music fans packed into the venue to expect "the mother of all parties" as the awards celebrated their 20th year. Sharon Osbourne said ahead of the show: "I'm so proud. It's his night. I just want him to have the best time." 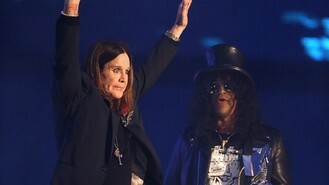 Ozzy said of the award: "I can't believe it, it's just incredible." With nominations across seven categories, Dark Horse singer Perry leads tonight's competition, closely followed by Ariana Grande with six. Both are up for Best Female, along with Minaj, Taylor Swift and Beyonce. Pharrell Williams is up for five trophies, including best song and best video for his global hit Happy. He is also among the nominations for Best Male in a category which includes Ed Sheeran, Eminem, Justin Bieber and Justin Timberlake. MTV held castings for more than 2,000 local music fans to be part of the audience for the show. Performances are expected by U2, Alicia Keys and Ed Sheeran, but DJ Calvin Harris pulled out yesterday due to illness. A performance by Grande opened the show before the US singer and actress picked up the first award for Best Song for her hit Problem, presented by Keys and Sande. Best Pop went to One Direction, who were not at the Hydro to collect the award but thanked MTV in a video clip. There were performances by Canadian artist Kiesza and Brighton duo Royal Blood. Mike Kerr and Ben Thatcher said ahead of the show: "The whole year has been a dream come true. We've got to meet pretty much all of our influences and play with half of them, so we are nothing less than grateful for how fortuitous we've been." Kiesza, who wore a colourful dress by Fendi, described her new album as an "eclectic mix". She said: "It's a mix of dance, slower power ballads and some RnB and hip hop elements, all kind of woven together." Glasgow is hosting the EMAs for the first time. The awards have previously been held in London, Liverpool, Belfast and Edinburgh. Time travel was the theme of the 2014 awards and clips and there were nostalgic moments as video clips were shown from some of the previous 20 ceremonies. Superstars U2 played in Rotterdam in 1997, Stockholm in 2000, Berlin in 2009 and returned to the EMAs tonight to perform Every Breaking Wave. Host Minaj gave a risque performance of Anaconda before guitar legend Slash appeared on stage to pay tribute to Ozzy Osbourne. He told the audience: "For four decades the Prince of Darkness has rocked anyone who dared to listen. "This is a guy who does not know how to do ordinary. He scares the hell out of most people and all bats. But to me is a gentle man and a gentleman." Following a montage of clips detailing Osbourne's career, the singer appeared on stage to collect the Global Icon award. He said: "I don't know where they got this icon s**t from but it's good to be here tonight. God bless you all, thank you for coming." Best Male went to Justin Bieber who thanked MTV via a clip and One Direction took another award for best live show.